Besides being a place for food preparation and cooking, your modern kitchen can be a prime social zone where your friends and family can gather to feast and spend quality time together. If you frequently entertain guests in your home, or love holding long leisurely dinner parties on the weekends, it’s a good idea to keep these points in mind when designing or remodeling your kitchen. Here are some tips on how to turn this functional area into a space that's fit and fun for gatherings. 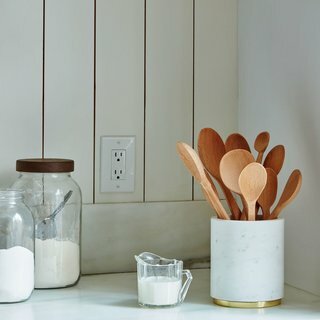 And make sure to scroll to the bottom to shop our favorite kitchen picks. 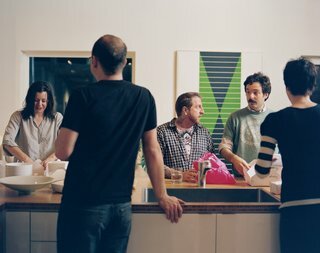 When there’s a crowd in your kitchen, it’s important to ensure that people are comfortable and can move around and mingle with ease. Avoid claustrophobic layouts with tight corners or islands that are placed too close to the walls. A doorless, open-plan kitchen is best, as it creates an inviting and spacious atmosphere. The eye-catching tile backsplash is by Popham Design. 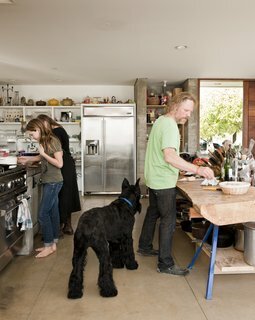 Think about how you and your guests will interact within and around the kitchen. It's important to ensure that people can effortlessly transition from the kitchen to the living room and dining areas, and vice versa. If you have a patio, garden, balcony, or courtyard, site your kitchen next to (or near) these areas so that dining alfresco can be an option. By designing a kitchen with good circulation and connectivity, you won’t have to worry about it being too cramped, as the crowd will naturally spill over to other areas of your home. The resident of this home wanted to be able to use the space as a fun gathering place for parties, so Bestor set a DJ booth at the edge of the kitchen. Custom plywood shelving holds vinyl records. 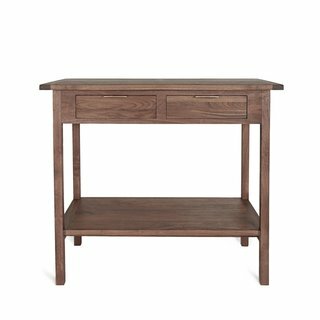 As a defining feature in many modern kitchens, the island counter shouldn’t just be a surface for preparing food. When it’s party time, clear out the counter top and bring out some stools so that guests can sit around the island and enjoy their beers and snacks—or even a casual buffet meal. While the open kitchen and living room space provide ample opportunity for entertaining, perhaps as compelling is the Kovels’ surprisingly private roofdeck. "We love to have parties over here," says Kovel, "and sometimes we go up to the roof." With a privacy screen vexing voyeurs to the west, and no other tall building, save the church spire, nearby, the Kovels and guests have free rein. "We have a hot tub up there," Kovel wryly discloses. 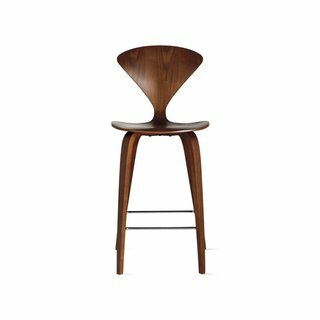 Although a pioneer in prefab housing, Norman Cherner is best known for the molded plywood seating line he created for the manufacturer Plycraft, which he ultimately sued the company over. The merry making isn't complete without refreshments, whether it's cocktails for the adults or homemade lemonade for the little ones. 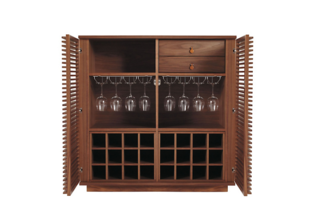 So, consider including a wet bar where guests can linger and chat. Because most wet bars are equipped with storage for glassware as well as a sink, you can wash glasses quicker, which will shorten the waiting time for beverages. It can also be used as a place to make some post-dinner espressos. 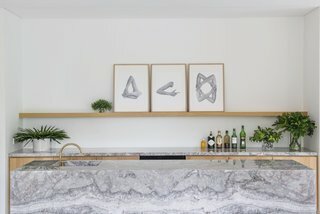 Shown here is the wet bar in Apartment G, designed by Takenouchi Webb. "I have always been inspired by the language of turntables and entertainment units from the 1960s," says Singaporean designer Nathan Yong. 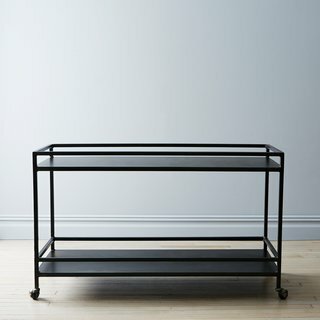 With a design inspired by vintage industrial steel carts from the flea markets of Paris, this custom-designed bar cart from Brad Sherman, the designer of Food52's offices, is luxuriously oversized—and anything but delicate. To create a more relaxed "living room" feel, keep your kitchen from looking too much like a place for cooking. Install discreet or streamlined cooktops, ranges, hoods, ovens, or "hidden" kitchen appliances like this built-in refrigerator with wood-finished doors from Sub-Zero. 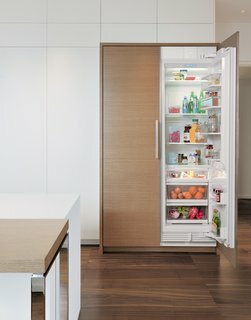 Integrated built-in refrigeration unit with smart-touch controls from Sub-Zero. Keep your kitchen clean, neat, and clutter-free with smart storage so that pots, pans, small appliances, and utensils are out of sight and out of mind. 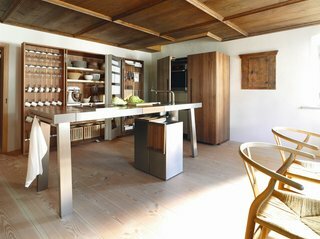 Bulthaup’s kitchen tool cabinets, which can be shut to hide all your kitchen essentials, help ensure that your kitchen isn't a mess when guests arrive. 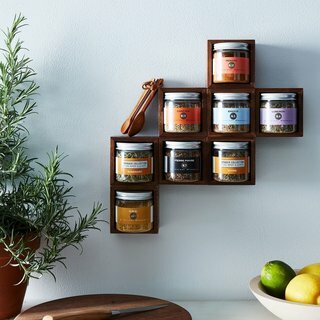 Build your own spice shelf. Build the spice shelf of your cumin's dreams—La Boîte, the spice experts, aficionados, and masters—have devised a genius system for storage (and display!). Walnut cubes perfectly fit La Boite's spice jars and, get this, magnetize to each other. 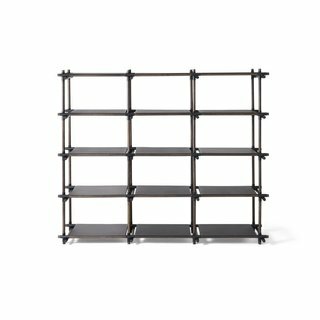 The Stick System by Menu A/S is a shelving unit that is versatile, strong, beautiful and easy to assemble in a variety of configurations to suit any need. 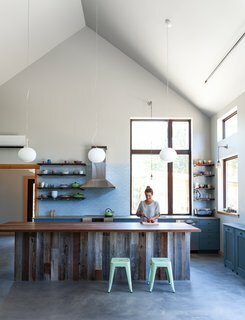 Interesting pendant lamps and backsplashes with bright colors or bold patterns can add character to your kitchen, transforming it from a utilitarian space to an area for fun. 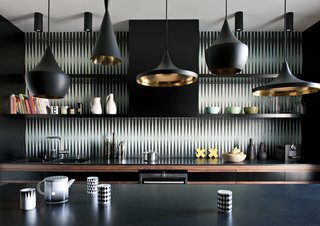 This dark and bold kitchen features Beat Pendants by Tom Dixon and a black-and-white tile backsplash by Popham Design. A good entertaining space should have a look that's consistent with the overall design of your home. Use the same (or similar) finishings and colors as the rest of the space. If you want the kitchen to stand out, you can introduce different materials or colors, but make sure they complement the overall interior concept of your home. Although it mimics the appearance of rickety mining shanties, the home is airtight. 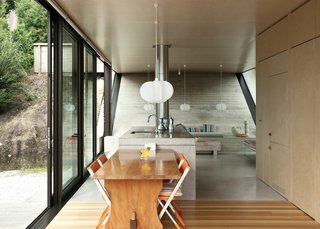 Triple-glazed windows and highly insulated walls contribute to its overall net-zero status. The concrete wall mimics the slope of the hill outside as a reference to early Maori structures that were dug into the land. 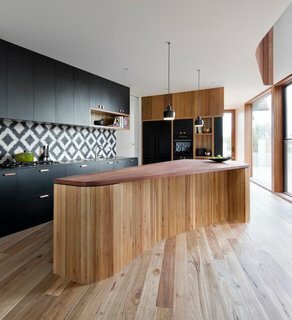 The simple kitchen has strandboard cabinetry and an MDF island that conceals a fireplace at one end. The ceramic works on the built-in seat at right are by Raewyn Atkinson and Robyn Lewis. Kitchen can-fidential. 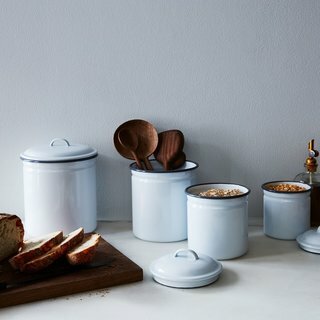 Durable and versatile enamelware is an endlessly useful addition to even the most well-stocked kitchens: It’s lightweight, stackable, dishwasher-safe, and can be used on the stovetop, in the oven, and on the grill. A smooth pour. At first glance, the spout and body of this hand-tarnished, solid brass decanter seem to be completely detached from one another. 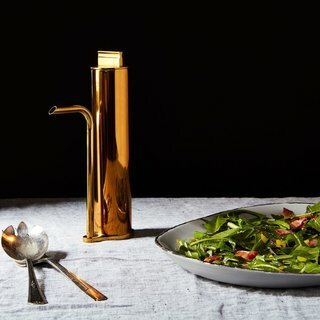 But begin to pour (keep your finger on its top), and it’s like the oil moves magically from the body and smoothly out of the sleek, gooseneck spout. 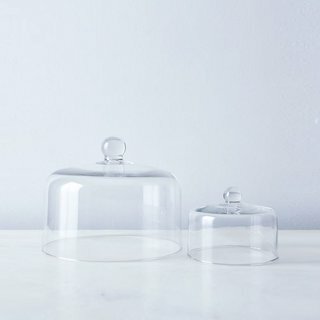 You know, I know, we all know—Food52 is mad for Mosser Glass cake stands. The only thing they were missing? A pretty glass dome to top it all off! Each a solid piece of blown glass, the domes are made to fit either the 6” cake stands or the 10” cake stands. 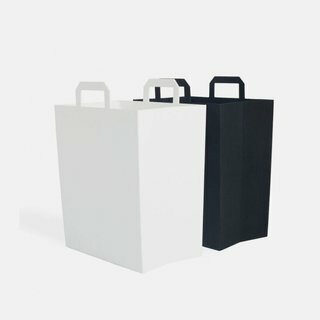 Cutting board and knife storage all in one. 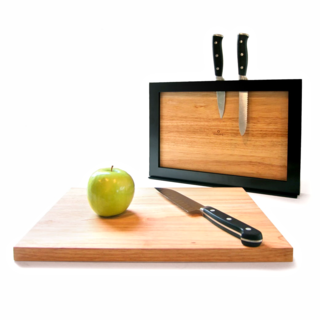 The frame that’s included with the Chops Cutting Board is an all-in-one storage solution that holds two cuttings boards in an upright, space-saving position, between which you can store your knives. Hold everything. We don’t know about you, but our kitchens feel infinitely more organized and user-friendly when cooking and serving utensils are displayed in canisters for maximum reachability. 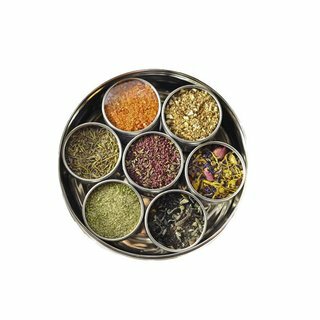 A beautiful collection of seven of our top selling salts. Each set includes a 4 oz tin of the following salts. When it brews it pours. 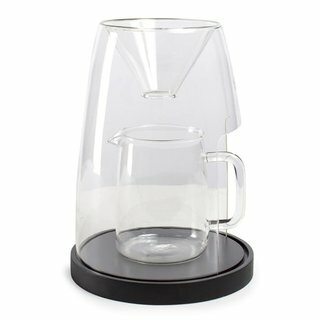 A pour-over coffee maker that lives on the countertop in a home or office, like a low-tech appliance. Hot water is gradually poured through fresh ground coffee in a filter, and brewed coffee slowly drips into the carafe, or even directly into your mug.